The development of capture fisheries in Indonesia aims to increase the production and productivity of the fisheries business based on sustainable fish resources management, as well as to improve the welfare of fishermen. The strategic objectives to be achieved are: Increased production of capture fisheries in marine waters and public waters; Increased fishermen’s income, and; Increased fishermen exchange rate (NTN). Therefore, the Government through the Directorate General of Capture Fisheries of the Ministry of Marine Affairs and Fisheries has implemented a program of development and management of capture fisheries, namely in the form of; Management of fish resources; Supervision and development of fishing vessels, fishing gear and fishing vessel manning; Development, improvement and management of Fishing Ports; Development of fishing effort and empowerment of small fishermen; Efficient, orderly, and sustainable capture fishery services, and management support. Efforts to supervise and develop fishing vessels and fishing gear and fishing vessel manning, among others, are carried out in the form of: fostering and developing the design and eligibility of fishing vessels; standardization and certification of fishing vessels, fishing gear and fishing crew; construction of fishing vessels > 30 GT and 10-30 GT; assistance provision of fishing facilities, fishing gear and fishing facilities on board, and; support engineering of ship fishing technology and fishing gear. While the development, improvement and management program of fishing port is done through: development of fishing port information center (PIPP); services of shrimp and fish catch certification (PIPP) at Fishing Port; improving services in fishing ports for the provision of fuel, ice and water; providing excellent service to business players in ports, as well as the initiation of the development of environmentally sound fishing port. Meanwhile, the development of fishing business and the empowerment of small fishermen is done through: increasing access to capital; rural business development (PUMP), diversification of fishermen business, capture fishery business development, enhancement of fisherman’s protection and work safety; development of business partnerships; development of fisherman card; development of minapolitan areas, and various other fishermen empowerment activities. The development of capture fisheries over the past five years shows an encouraging performance, with capture fisheries growing at an average rate of 3.8% per year. The fishermen exchange rate (NTN) also continues to increase. Over the past five years, NTN has been above 100 and continues to show an upward trend. This shows that the fisherman’s welfare level is getting better. In terms of infrastructure, there are currently 816 fishing ports, consisting of 22 Central Fishing Ports, 792 Provincial Fishing Ports (Provincial and Regency / City), and 2 Private Fishing Ports. The ports are continuously upgraded in terms of infrastructure as well as systems and management to support and improve economic and business activities in the field of capture fisheries. For the development of capture fishery facilities, the government has allocated aid for 1,000 units of fishing vessels of > 30 GT distributed to Joint Capture Fisheries Business Groups. In addition, assistance of 10-30 GT fishing vessels, on board fishing gears and fishing facilities has also been allocated to various regencies/cities. Meanwhile, in an effort to empower fishermen, the government has increased access to business capital through the Development of Rural Business Program (PUMP) of Capture Fisheries. In addition, continued facilitation and increased access to capital through increasing the distribution of People’s Business Credit (KUR), as well as Credit for Food and Energy Security (KKP-E). Increased access to capital is then strengthened by providing assurance of asset ownership, especially land and ships. Related to this, the fisherman land certification activity has been developed in cooperation with BPN. 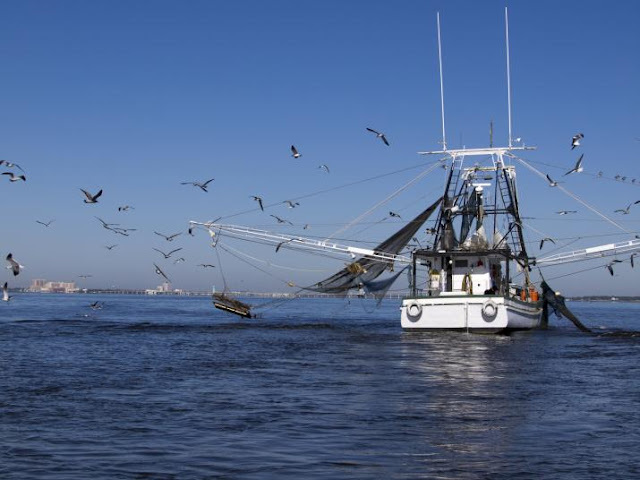 Furthermore, there is a social security insurance development for fishermen to provide protection certainty and social security for fishermen whose scope of work is highly risky. To reduce fishermen poverty in fishery centers, the government has also implemented a Fishermen Livelihood Improvement (PKN) program, such as: construction of very cheap houses, development of alternative and additional work for fishermen families, access to education and health, and others. While efforts undertaken to improve fishing business services to be more outstanding are; development of Data Sharing System (DSS), on-line licensing service, central licensing assistance in the region, and others. Sustainable fisheries development requires support from all stakeholders, from government, business actors, academics and the wider community. In addition, the development of capture fisheries also requires prudent sensitivity and awareness to contribute significantly in improving the welfare of the community.